Poisons are substances that are harmful to living organisms. It is said that "the dose makes the poison" because almost any substance can be poisonous at high enough concentrations, especially many substances used as medicines. Poisons include compounds of biological origin and chemicals manufactured by humans. Biological poisons, also known as toxins, are produced by some members of every living kingdom, including bacteria, fungi, protists, plants, and animals. The chemical industries produce thousands of chemicals, many of which are poisonous. Regulation of workplace exposure to these is the responsibility of the Occupational Safety and Health Agency, or OSHA. The Environmental Protection Agency (EPA) oversees cleanup of toxic wastes and spills. There are three major routes of exposure for poisons: absorption through the skin, inhalation into the lungs, and ingestion in the gut. Skin forms a barrier against many poisons, but its large surface area provides a route of entry for liquids especially. Inhalation provides a rapid route of entry directly into the bloodstream for small, volatile molecules. The enzymes and acids of the gastrointestinal tract inactivate some ingested poisons, but the long transit time and high surface area of the gut mean that an ingested poison is likely to enter the bloodstream if not inactivated. Most poisons act acutely, meaning their toxic effects come on very quickly after exposure. In contrast, heavy metals such as lead and mercury accumulate slowly in the fatty tissue of the body, and chronic exposure to low doses can cause poisoning. Poisons disrupt metabolic processes or destroy tissue through chemical reactions with cells. While the number of specific mechanisms of action is large, there are several broad means by which many poisons exert their effects. The list below is not comprehensive. Oxygen Deprivation. The brain consumes large amounts of oxygen and cannot survive if deprived of it for more than ten minutes. Oxygen deprivation may occur if the respiratory muscles cannot deliver adequate air to the lungs, if the lungs cannot absorb adequate oxygen from the air, or if the blood cannot carry the oxygen to the brain. Barbiturates and benzodiazepines, drugs prescribed as sedatives, depress activity in the brain center that controls the respiratory muscles, thus preventing those muscles from working sufficiently. Respiratory muscle paralysis may be caused by ingestion of botulinum toxin, one of the most poisonous substances known. It is formed by the bacterium Clostridium botulinum, a contaminant of improperly canned food. Botulinum toxin prevents release of acetylcholine by neurons at the neuromuscular junction. Without this neurotransmitter, the respiratory muscles cannot contract. Absorption of adequate oxygen can be interrupted when otherwise harmless gases, such as nitrogen or carbon dioxide, are present in high concentration. In 1986, a massive release of dissolved carbon dioxide from Lake Nyos in Cameroon, Africa, asphyxiated eighteen hundred people in the surrounding villages. Hemoglobin carries oxygen in the bloodstream. Carbon monoxide binds to hemoglobin, displacing oxygen and preventing its transport. Carbon monoxide is produced by combustion and is found in car exhaust and furnace smoke. 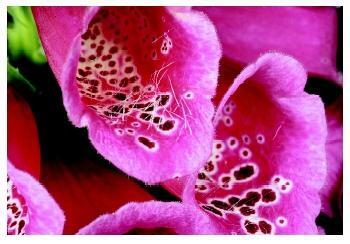 Digitalis, derived from the foxglove plant, is prescribed for congestive heart failure to increase heart output. In slightly larger doses, it is deadly. various South American frogs of the genus Dendrobates, and are used on arrow tips for hunting. Mitochondrial Poisons. Most cells in the body are supplied with fuel by subcellular structures called mitochondria . One step of the energy-producing reactions, oxidative phosphorylation , relies on electron-carrying proteins called cytochromes. Cyanide binds permanently to these cytochromes, preventing them from carrying electrons and thus inactivating them. Another step in these reactions requires a buildup of H + ions across the mitochondrial membrane. Dinitrophenol, a chemical used in dye manufacture, is a membrane-soluble H + carrier. By carrying H + ions across the mitochondrial membrane, dinitrophenol interrupts this step. Impaired energy production affects all cells, especially brain and heart cells. Liver and Kidney Poisons. The liver is the principal site of poison detoxification. It has many different types of enzymes that attack and degrade the wide variety of molecules to which the body may be exposed. Inhalants such as glues, gasoline, or other solvents cause direct tissue damage to the liver, leading to liver failure. The kidneys excrete most poisons or their breakdown products. Kidneys may be damaged from exposure to poisons, or by accumulation of compounds that cannot be excreted. Mutagens and Carcinogens. Chemicals that cause changes in deoxyribonucleic acid (DNA) sequence, or mutations, are called mutagens. If these changes prompt the cell to begin dividing, the cell may become cancerous. Substances that cause cancer are called carcinogens. Inhaled asbestos fibers can cause lung cancer, as can chemicals in cigarette smoke. Antidotes are available for very few poisons. Snakebite, for instance, may be treated with antivenin, which provides antibodies that inactivate the poisonous venom. However, in most cases of poisoning, medical treatment focuses on removing the poison from the body when possible, and maintaining respiration and circulation until the toxic effects are reduced as the compound is metabolized and excreted over time. Poison control centers in every state maintain telephone hotlines to deal with poisoning emergencies. If a victim is in medical distress, 911 should be called immediately. American Association of Poison Control Centers. <http://www.aapcc.org/> . Medical Toxicology On-Line. <http://toxikon.er.uic.edu/> . Turkington, Carol. The Poisons and Antidotes Sourcebook, 2nd ed. New York: Checkmark Books, 1999.